p.s.- notice how good it looks on the outside part of the wheel. Last edited by LudeLove99; 03-20-2008 at 07:18 AM. is that patch the only bad part on the tire? or is the entire diameter on the inside like that?? yeah that just means the suspension wasn't aligned (the top of the tire was tilted inside) and those were the tires I bought the car with 5 months ago. 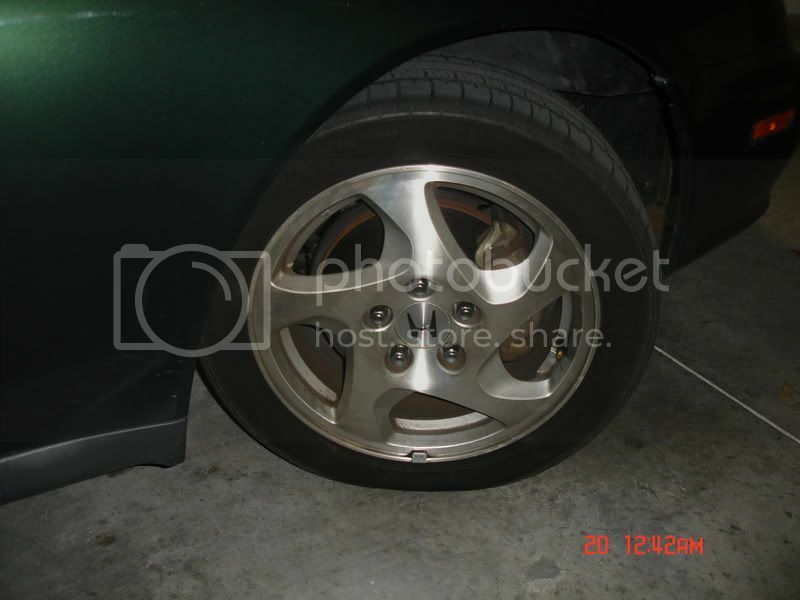 My plan was getting the car all 4 new tires in about 2 months or so(before I knew this) and getting it aligned. More bad news were that wal-mart didnt have the tire, pepboys didn't, Roadrunner was the only one that can order them for tommorrow. They offered me 2 tires for 75 each includes installment and balance. Oh and the brand is hankook. yeah (twokex) pretty much. I'm gonna have to trash it(air keeps escaping out every 12 hours its flat again). The whole inside tire is like that plus the left doesnt look that bad but its getting there..
you got some mad serious negative camber goin on. 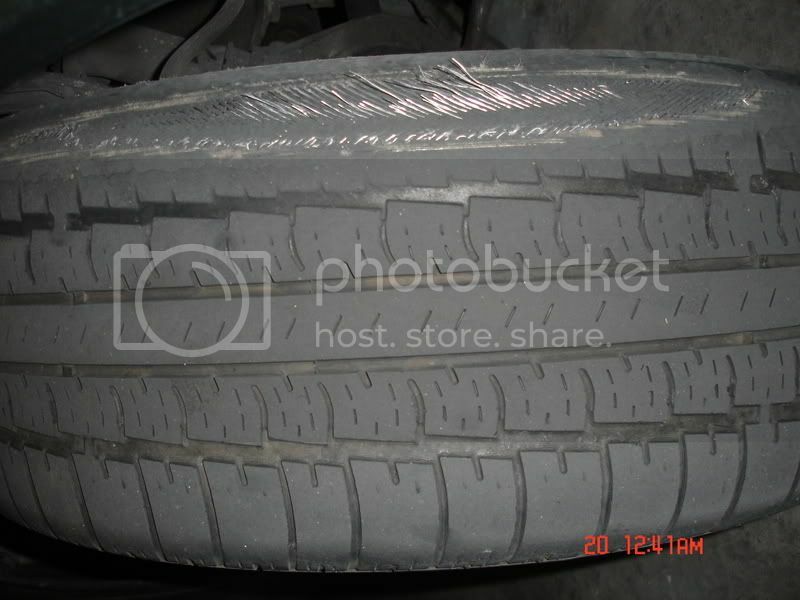 get that sucker aligned as soon as you get them new tires on! What do you guys think about the deal.. Everywhere I went the tires weren't there all they had was the 55 r16 instead of the 50 r16 its supposed to have. Man those tires look like monster truck tires hell no! Anyway, the deal is $75 for each $150 for both, installed and balanced(hankook)..
and that, boys and girls, is the result of negative camber and toe. is your car lowered? what would cause your alignment to be so whacked? fix it when you put the new tires on. make sure they do the toe. if they look at you weird, go somewhere else. Mate the stock size is 205/50/16, so if you're sticking with 16s stick with that size, going bigger will put your speedo out, not to mention look crappy. Yeah brash thats what I meant that the tires look awfully big(55) and the 50's are rare nobody has them. Anyways, today I got the tires and did the alignment. They fixed the toe but I needed a camber kit to fix the outragously negative camber on the right suspension(2nd pic) the computer read a negative 1.1. I don't know I got this car in november and since teated it like a baby maybe the last owner got into a lil crash. Carfax says this car had only one owner before me, the car was well maintained hence the miles(138k) so I know the owner took very good care of it. I don't know maybe the mileage could've affected the camber? 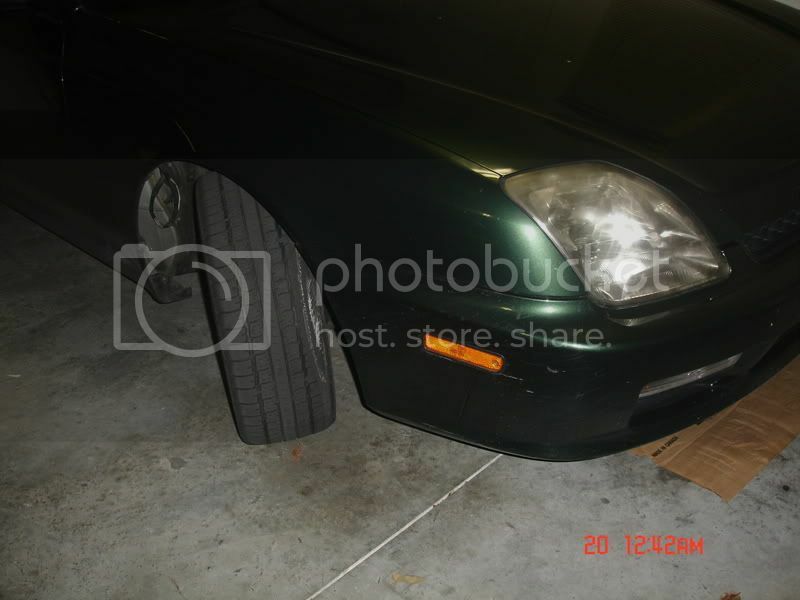 Oh and no this car aint lowered but its about to be with the Tein Dampers and a camber kit to fix this problem. for the most part, when the toe is set right, even lowered ludes don't need camber kits. so an accident, or maybe he went over a curb or something, is definitely suspect. I've said this in another post but I have the same problem with the negative camber in the front and so does another guy. I READ that ludes came like that which is one of the reasons why they turn so well but who knows... You should have seen the tires that came with my car when i bought it...worn to the belts on the insides. Last edited by hojemwod; 03-21-2008 at 11:02 AM. hankook is a good tire, and that's a good deal. I'd be very careful to make sure you get the right person to adjust the toe for you. Listen to hotrod, he knows his stuff. p.s. I have hankook on my volks!